The Vietnamese Communist Party remains firmly in power, despite rising public discontent over the lack of personal freedom, government corruption and land seizures by the administration. At the Communist Party’s five-yearly congress in January 2016 the conservative faction within the party seems to have gained more influence. While the new leadership has tightened its grip on the civil society, economic reforms continue. 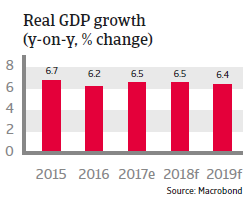 As in 2017, GDP growth is expected to remain high, above 6% in 2018, making Vietnam one of the fastest growing emerging markets in the region. 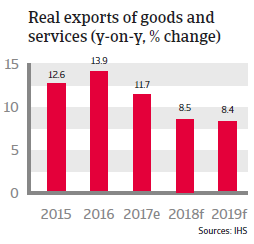 The economic expansion is driven by both domestic demand and exports. 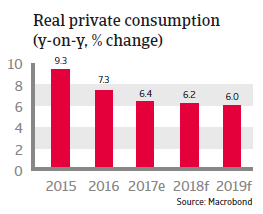 While high wage growth supports private consumption, foreign investments, especially in the electronics sector, provide a stimulus to exports. The export sector also benefits from the relocation of export-oriented industries away from China due to Vietnam’s relatively low production costs. Business investments are helped by policies to liberalise regulations and to deepen global economic integration. Inflation increased to 3.5% in 2017 and is expected to rise to more than 4% in 2018, due to rising commodity prices and currency weakness. 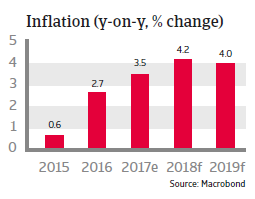 The central bank will probably tighten monetary policy this year in order to keep inflation under control, but also to remain cautious when rising interest rates as the government does not want to slow down growth and has little room for fiscal expansion. Fiscal consolidation will progress only gradually, with the budget deficit expected to remain above 5% of GDP in the near term. Increasing tax receipts are counterbalancing infrastructure investments and growing welfare costs. Government debt, which peaked at 62.2% of GDP after an increase in the years before, may decrease gradually in the coming years, but will nevertheless remain high. Vietnam's foreign debt has been fairly stable and well financed over the past couple of years. As a percentage of GDP it will remain high (45% in 2018), but low in relation to export revenues (43%). Foreign debt mainly consists of government debt with long maturities and a low debt service. Despite improvements Vietnam´s liquidity situation remains weak, as international reserves in months of import cover remain low at about 2 months – mainly due to high import growth. However, foreign exchange reserves are sufficient to cover the external financing requirements. 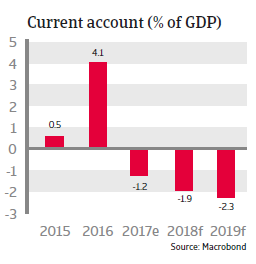 The possibility of the Vietnamese dong weakening in 2018 cannot be excluded, due to a rising current account deficit and further monetary tightening in the US. The central bank has taken steps towards a more market-oriented approach, adjusting the fixed reference rate against the USD on a daily basis. Due to this and Vietnam´s limited international financial integration, sharp exchange rate devaluations are less likely than they were in the past. 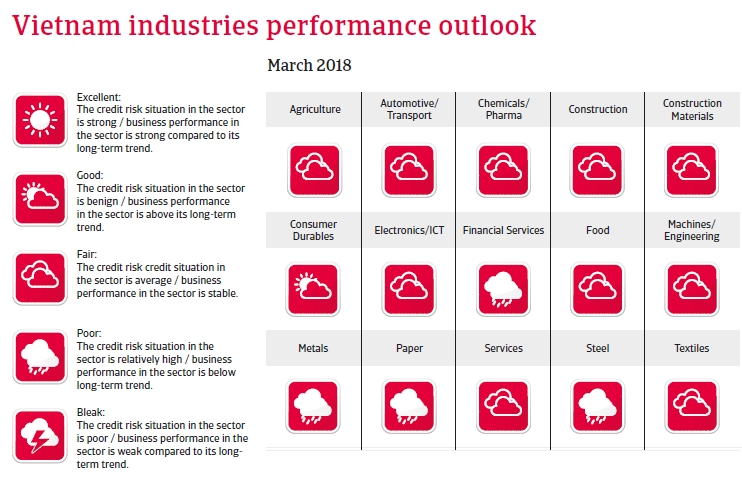 While high savings and investments and the low share of commodities in exports are strong points of the Vietnamese economy, the business environment continues to be hampered by weak institutions, infrastructure issues and endemic corruption. The level of state intervention remains high, and while the share of state-owned enterprises (SOEs) in the economy is high, many of them are financially weak and inefficient, hampering productivity increases. While privatization efforts are ongoing, the process remains slow. 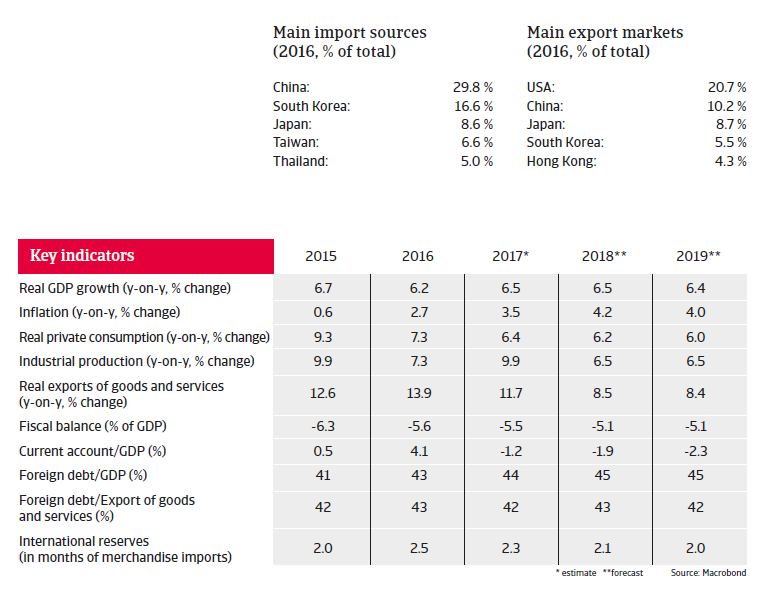 Foreign-owned businesses account for about 70% of Vietnam´s exports, which makes the economy vulnerable to a slowdown should foreign companies withdraw their operations (e.g. in search of cheaper labour). According to the Asian Development Bank (ADB), only 35% of companies are integrated into export industries as domestic suppliers to foreign-owned export businesses in Vietnam (compared with nearly 60% in Malaysia and Thailand). Despite some improvements due to the high economic growth rates, the Vietnamese banking sector suffers from low transparency, weak capitalization, state intervention and a high rate of non-performing loans, due mainly to politically motivated lending. Bank restructuring has become a priority for the government, which has set up a dedicated management company to buy bad loans. However, uncertainties about the size of bad debts and the way in which the bargaining takes place, make it unlikely that this problem will diminish soon.